Mrs. Herbert JOHNSTON, 45, formerly of Decatur county, shot and fatally wounded her husband, 46, at their home in Mount Ayr last Thursday about 11 0’clock. He died in an ambulance in which he was being taken, together with his wounded wife, to a hospital in Creston. Mrs. JOHNSTON lies in the Creston hospital in a critical condition. Mr. JOHNSTON had just arrived at the family home in Mount Ayr, according to reports, when his wife, Pearl, entered the room. Shortly afterward she fired at him three times with a .38-calibre pistol. She then turned the gun on herself after going into the kitchen and turning on the light. The bullet passed through her body just above the heart. JOHNSTON managed to get out on the porch and call for help. Neighbors came to his aid and officers were quickly summoned. Mrs. JOHNSTON was found lying on the kitchen floor. An ambulance was summoned and both were placed therein and the race started to the Creston hospital. Mr. JOHNSTON died in the ambulance on the road between Arispe and Afton. The body was returned to Mount Ayr where funeral services were held Sunday afternoon at the M. E. church. Burial was at Ellston. Mrs. JOHNSTON was taken to the Creston hospital where she has hovered between life and death. Mrs. JOHNSTON is a daughter of Mrs. and Mrs. John DALE of Leon, who have the sympathy of everyone in this sad affair. Mr. JOHNSTON had been in Creston during the day, and had called at the Hatch Motor Company establishment shortly before six o’clock. He had just returned to his home when the tragedy took place. 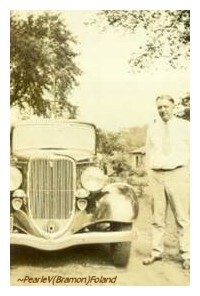 He was a Ford dealer at Mount Ayr and had garages in Mount Ayr and at Diagonal. He was a member of the Mount Ayr school board, the country club, and of the Masonic order. He was also a Shriner. They have two sons, Rupert, 18, who is at home, and Raymond, 25, who resides in Mount Ayr. Mount Ayr people who knew the JOHNSTON family well have given no reason for the shooting so far as had been learned other than that they had quarreled. A coroner’s jury Friday morning returned a verdict stating that he had met death at the hands of his wife, Pearl, by a bullet, fired by her. Any other circumstances connected with the tragedy have not been learned in Leon at this time. NOTE: At the bottom of this clipping, Pearle V. (BRAMON) FOLAND noted that it was dated May 7, 1934. Herbert JOHNSTON was a twin of Horace A. (Andrew) JOHNSTON (1887-1979), Ford motor dealer in Diagonal, Iowa. Probably the largest assemblage that was ever present at a funeral service in Mount Ayr, was in attendance, the auditorium, galleries and basement of the church being filled to capacity and several hundred persons stood outside the church during the service. The amplifying equipment used by T. S. RHOADES at his funeral home had been installed at the church and the impressive services were heard by all. Among those present were a large delegation of Ford dealers and salesmen from Des Moines and many Ford dealers from surrounding towns. In his sermon, the Rev. Mr. TALLEY emphasized the principles of justice, kindness and humility. It was a masterful address, designated to bring comfort to the bereaved family and friends and to the attention of all the importance of right relationship with the Creator. Closing his address the speaker quoted the beautiful lines from TENNYSON’S Crossing the Bar. Music for the occasion was furnished by a quartet composed of Mrs. Roy SPURRIER, Mrs. Earle K. ALLYN, Leland DALBEY and Roy SPURRIER. Pall bearers were Roy MILLER, Vern WHITMORE, Raymond and Clyde FERREE, Hollie EMLEY, employees of the JOHNSTON Auto Company at Mount Ayr, and Doc BOYD of Grand River. Other employees, Weldon MAIN, Roy WARNER, Geo. BURNSIDE, Paul DINKLE, Paul ANDERSON and Ray SCHLAPIA and their wives and wives of the employees who served as pall bearers furnished cars and had charge of the flowers. In addition to the large number of persons who were in attendance at the services in Mount Ayr and who went from this city to Ellston about two hundred friends in the Ellston vicinity were present at the services at the grave. Among the relatives and friends in attendance at the funeral were Mr. and Mrs. Theo. GERMAN and Mrs. T. DORNAM, Shelby, Neb. ; Mr. and Mrs. C. A. CLARK, Waterloo, Iowa; Mr. and Mrs. C. J. WISE and son Gould and Mr. and Mrs. R. S. JOHNSTON of Dallas Center; Mr. and Mrs. Ray WILEY and Mr. and Mrs. John DALE of Leon; Mr. and Mrs. Robert ELLIOTT of Des Moines; Mrs. M. J. YOUNG of Indianola; Mr. and Mrs. Milton FAUROT of Sharpsburg; Mr. and Mrs. Albert HOLLAND of Clarinda; Mr. and Mrs. Robert HOLLAND and son Richard of Diagonal; Mr. and Mrs. B. M. LEE of Red Oak; Mr. and Mrs. R. O. BAILEY of Newton; Mr. and Mrs. Clarence McCUEN of Des Moines; Mr. and Mrs. Myron ORR of Indianola; Mr. Orr WHITE of Indianola; Mr. and Mrs. W. E. HENSS of Newton; Mr. and Mrs. Guy HUPP, Mr. Elmer HUPP of Beaconsfield; Miss Burnice ALLBAUGH of Leon; Mr. and Mrs. Paul JACKSON and daughter Bernice and Mr. Jack JACKSON of Ellston; Mr. and Mrs. Homer FOLAND and daughter Norma Gertrude of Grand River; Mr. and Mrs. Harry KNAPP of Readfield; Mr. and Mrs. Clarence KIMBALL and Mrs. Harriett GOODMAN of Des Moines; Mr. and Mrs. Harry FOLAND and Mr. and Mrs. Rollie DALE and daughter Geraldine of Garden Grove; Mrs. T. T. JOHNSTON of Dallas Center, Iowa. Herbert Theodore JOHNSTON was born on a farm near Beaconsfield, Iowa, August 13, 1887, the son of T[homas] T[heodore] and Elizabeth Alice (HESS) JOHNSTON. He died Thursday, June 7, 1934, at the age of 46 years, nine months and 24 days. His early childhood was spent on the farm and in the town of Ellston. When he was 13 years of age, the family moved to the town of Grand River, in Decatur county, Iowa, where he grew to manhood, attended the public school and received his early business training in the general store owned by his father. On December 3, 1908, he was united in marriage with Miss Pearl DALE, who survives him. He is also survived by his two sons – Raymond of Mount Ayr, Iowa, and Rupert, a student in Mount Ayr high school; one brother, Horace JOHNSTON of Newton, Iowa; one sister, Mrs. Alice FOLAND of Grand River, Iowa; and one grandson, Ronald, the little son of Mr. and Mrs. Raymond JOHNSTON. 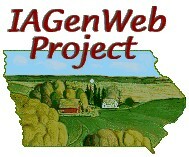 In the year 1918 the firm, Johnston Auto Company, was formed, members of the firm being the late T. T. JOHNSTON and his twin sons, Herbert and Horace and the Ford automobile agencies in Mount Ayr and Diagonal were purchased, the father and son Herbert moving to Mount Ayr and the son Horace locating in Diagonal. At the death of the senior member of the firm, in 1929, full responsibility for the general management of the business devolved upon the son, Herbert, and it is largely due to his excellent business ability, his aggressive spirit, and high sense of responsibility to patrons that the business continued to expand and included at the time of his death the Ford agency and service station at Mount Ayr, the Mount Ayr Service Station of which Raymond JOHNSTON is manager, the Diagonal Ford agency and service station and the business at Newton, Iowa, which is managed by Horace JOHNSTON. “It is not all of life to live. At his untimely death the community mourns. 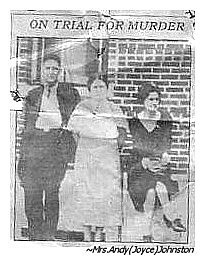 MOUNT AYR, IA - Mrs. Pearl JOHNSTON (right), whose trial on charges of murdering her husband, Herbert JOHNSTON, opened in district court here Wednesday, is seen with Rolla SHEWMAKER (left), her attorney, and Mrs John SNEDAKER (center), her guard. NOTE: Joyce stated, "We don't know know where she was sent. I have heard that her sentence was for 8 years. . .I also heard that when she got out of prison, one of her sons took her to the Dr. who xrayed her lungs. The Dr. told the son that one of her lungs looked as tho a bullet had passed thru it. ???"